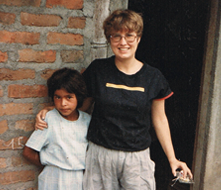 Suzanne Baker with Adely, taken in Isiqui, Nicaragua, where Suzanne was doing her dissertation research in anthropology. Suzanne attended Boston University. Class of 1985 and 1995. 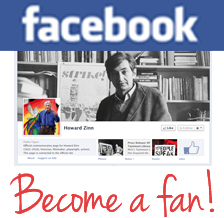 I never actually had Howard as a teacher INSIDE a classroom. I was a graduate student in Anthropology and he and I were in the same “affinity group”—a group of like-minded students, staff, and professors who got together to participate in protests and civil disobedience during the 1980s in Boston. It was part of the Pledge of Resistance, and we were arrested together in Boston in May 1985. Some of us refused to cooperate or give our names, and remained in custody, while others left to make arrangements for us. When Howard left, he brought out an apple from deep within this long coat he wore and gave it to me. I can’t tell you how often I think of that apple. Howard’s calm, quiet insistence on doing what was right and taking a stand for those in Central America who were being damaged by our government’s policies are lessons that have stayed with me for a lifetime. I still miss him. My daughter wants to study history in college, and the first history book she owned was A People’s History of the United States.